QuickHelp is an excellent free Windows 8 guide app developed by Brainstorm, which has a huge collection of nice video tutorials on “how-to” for Windows 8, as well as Microsoft Office Tools including SharePoint 2013, SharePoint 2010, Word 2013, Word 2010, Outlook 2013, Outlook 2010, Excel 2013, Excel 2010, Publisher 2010, and Viso 2010. You can browse through the app or search for a particular topic using the Windows Search Charm or the app’s search button, and Tag the videos as your favorites for easy access. This free Windows 8 guide app is best suited for organizations, as they can give an on demand trainings to employees and staffs using this app, and hence increase their productivity. The app is equally useful a regular users as well. 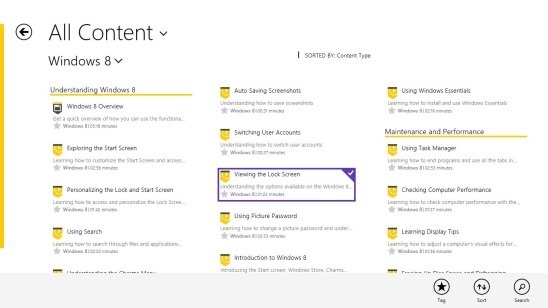 You can get this free Windows 8 Guide App in the Productivity Category in Windows Store. The app is slick and all the tutorials are very precise. The information given by each tutorial is recommendable. These tutorials contains step by step , easy to understand instructions on how-tos. Plus you can learn some handy tips and tricks from these video tutorials. 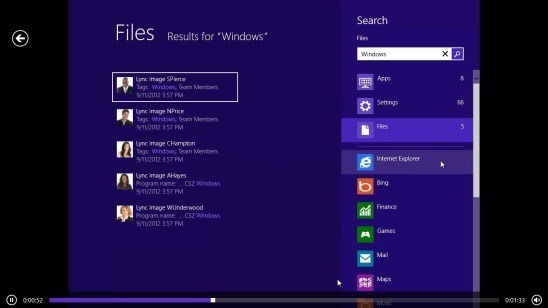 This free Windows 8 guide app is beautifully designed and the interface looks intuitive. 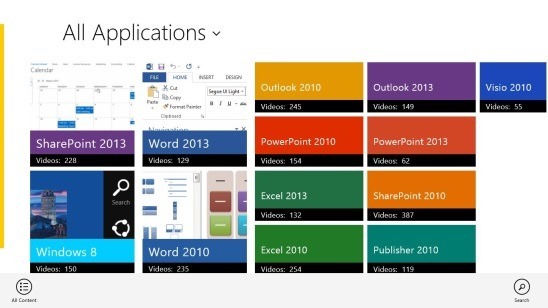 You can see the live tiles of Sharepoint, Word, and Windows 8 within the app itself. Plus the app also has its live tile on start screen. You can either view a list of all the contents, or filter them according to recommended videos, recently viewed, and tagged videos. Besides this, the app also lets you sort the content lists. Like said before, you can search for a particular tutorials by using the app’s search button or Windows Search Charm (Win+Q). After that you can simply click on the requisite video in order to view its tutorial. Viewing videos in full screen makes learning a good experience. The video quality is good, and there are simple video control buttons. To Tag videos as favorite simply right click on the tutorial’s screen and click on Tag Button on the flyout. Amazingly useful Windows 8 Guide App. Added video tutorials on MS Office tools. Option to Search for particular tutorials. Option to Sort tutorial lists. QuickHelp is an all-time useful Windows 8 Guide App and the app is equally good for everyone. It has answers to almost every question which a user might face while using Windows 8 or MS Office Suite. Plus there are tips and tricks in these videos. You’ll get free limited content with your Windows Live ID . But for more tutorials you need to get a paid subscription. All in all, it’s a free and amazingly useful app to try.